Today I was lucky enough to participate in a Demo Day of next season’s skis, held at Stratton, VT for northeast ski shop employees. It was phenomenal. Lots of different manufacturers set up in booths in front of the lifts. You could click in and out all day, which we did. It was ski gear heaven. Unfortunately, the conditions were less than ideal. Rain and fog made visibility practically nonexistent for much of the day. And the snow was a thick, messy glop. Also, a big part of the mountain was closed. 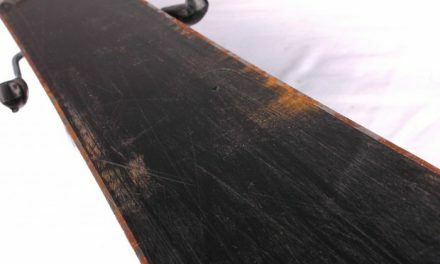 So all the things I’d love to find out about skis — how they perform on ice, in powder, in bumps — were impossible to determine. What’s more, at this point I could only demo what the shop wanted me to demo. And I couldn’t spend much time with any one ski. I was on/off/on/off. So I was too busy and rushed to get any specs. What follows, then, are are basically my impressions formed by one or two runs in crappy conditions. So take it for what it’s worth. First, I did pop into a couple booths before I started skiing. Saw next year’s K2s. They’ve changed the graphics (finally), and I must say, they really look great. Everything is pretty much the same, except the Burnin’ Luv is now 70 underfoot, instead of 68. I also managed a quick look at the Heads. The names have changed. They’ve gotten rid of the whole “Thang” nomenclature and replaced it with “One.” So there’s the Every One, the Power One, and so on. The graphics are different, but other than that, the skis remain the same. And I (quickly) checked out the Volkls. There’s a new ski called the Aurora that looks very, very cool. 84 underfoot. A gorgeous looking ski. The bindings are designed to go right out to the edge for improved edge-to-edge responsiveness. I have to give these a try! The Fuego and the Tiara are the same. And the Aura has different graphics. Heavens Gate: 74 underfoot, 10.5 turning radius. The women’s Metron. A nice ski. Very turn-y. It’s this year’s Foxy Mama. A black and purple color scheme. 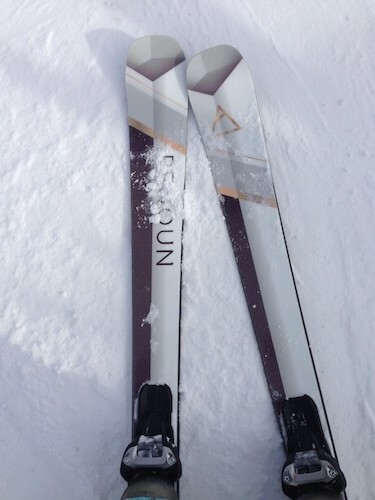 Cloud 9: A VERY nice ski that replaces the Royal Minx. I liked this one a lot. The ski has four flex zones in the front and two in the back. 11 turning radius, I think 74 underfoot. Cloud 7: The same line as the Cloud 9, but one step down. Three flex zones in the front, one in the back. A softer ski. Didn’t like it nearly as much as the 9. Got pushed all around in the gloppy stuff. Attraxion 3: New graphics, but didn’t really like the ski. Got thrown around a lot in the gloppy stuff. Scratch: A twin tip! Very cool graphics. And really a lot of fun, though it’d have been better if someone else who skied in the park could try them out. Voodoo: The best of the lot of the Rossis I tried. Still, I was’t wowed. This is one I would’ve liked to try under different conditions. And the graphics were a little too pastel for my taste. Fischer: I must admit, I have a soft spot for these. Vision Exhale: The core consists of a channel filled with a composite surrounded by wood on either side, so it’s very light with the characteristics of a wood core. A very zippy, fun ski. Topaz: An okay ski. 71 underfoot, 11.5 furning radius. Not a wood core ski. More forgiving. Wave Spice: Very, very nice. These skis busted through the crud like nobody’s business, and were still able to get up on edge. 80 underfoot. Free Spice: Definitely the coolest graphics of the day. A wide ski that’s also great in the crud, but not as good as the Wave. Favs of the day: Salomon Opal, Atomic Cloud 9, and the Wave Spice. I plan to go back on Thursday to demo the skis that I want to demo. I’ll post Part 2 later. PreviousThe core of your being. NextA sneak peek at next season’s skis — Part 2.